Chicken Tawaala recipe by Soniya A Khan at DesiRecipes.com. Prick the chicken pieces with a fork. Mix the Ginger / Garlic , salt and 4 tbsps of oil. Cover the chicken pieces with this marinde and set aside for 30 minutes. Heat the remaining oil. Then add the chicken and stir. Add the onion , green chillies, red chilli powder, black pepper and ginger . Stir and cook till the oil seperates. 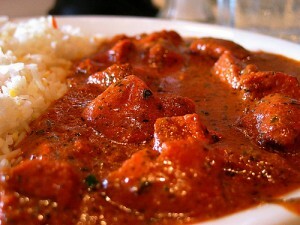 Add the "Makhani gravy" and cook over a low heat, for approximately 25 30 minutes, till the chicken is tender. Sprinkle the coriander leaves and all spice on top. In a saucepan combine the first 6 items listed under MAKHANI GRAVY and cook till they blend. Bring to a boil, then add the butter and cream, stir through, add the fenugreek . tried it its fine .